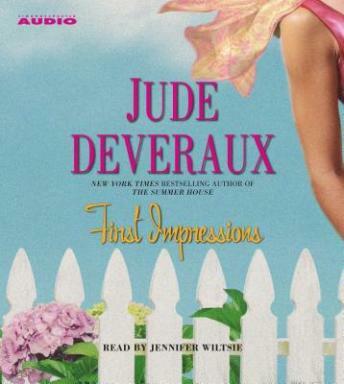 A contemporary novel of romance and renewal from perennial bestseller Jude Deveraux, First Impressions is an emotionally charged story of one woman's bid to start over. Eden Palmer knows how to make it on her own. This forty-five year-old single mother has worked hard to raise her beloved daughter. Melissa, Eden's daughter, has long been the jewel of her life but there comes a time when a mother must come into her own. So Eden moves to Arundel, North Carolina to take ownership of Farrington Manor. Torn between the desire to stay with her daughter and the need to build a separate life on her own, Eden opts for some much needed perspective. Her move is met with delight in some quarters, and jealousy in others. Pursued by two eligible bachelors, Eden is flattered, and more than a little suspicious. Juggling the attentions of two men is hard enough, but soon Eden's bid to start over plunges her in the middle of a mystery that threatens not just her plans and reputation, but her very life. Can she use one man to save her from the other?